Bye bye August!!! I can't believe that summer is over and fall will soon begin. I wanted to share with you some of my favorite August Instagram looks!! I love love this Moto jacket. It is definitely a fall must have. You can read about it here. 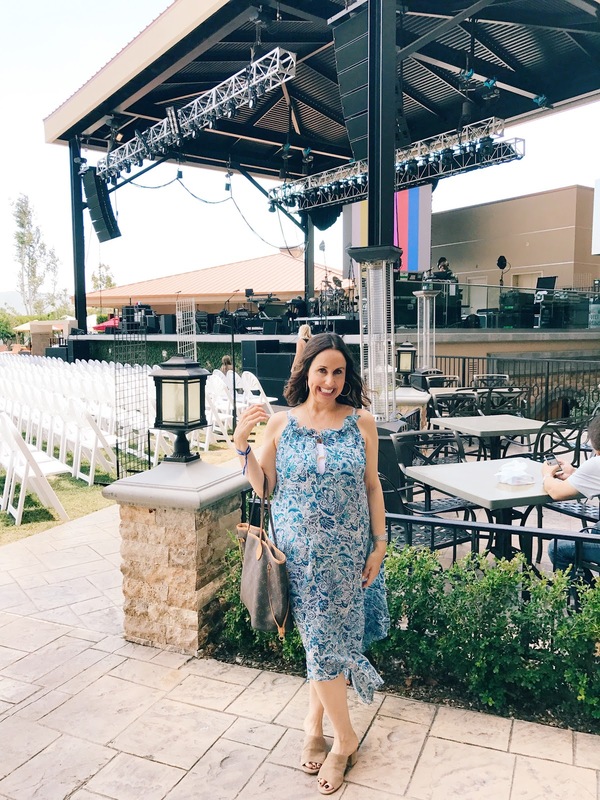 I had the best time with my forever plus one Cathy at the Pala Influencer event. You can read about it here. I am loving all things blue. You can read about this look here. 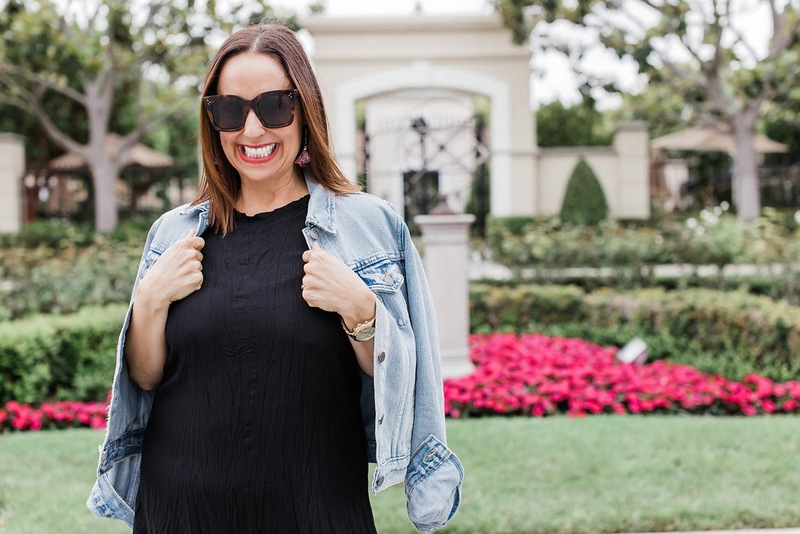 I love a great jumpsuit and this one by Minkpink is one of my favorites. You can read about it here. 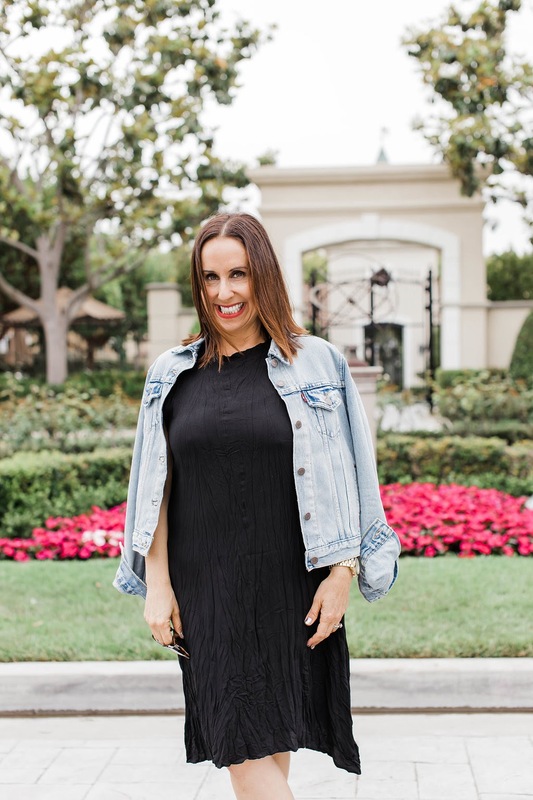 I love this LBD!!! You can read more about it here. I am obsessed with this top from Amour Vert. Read more about it here. 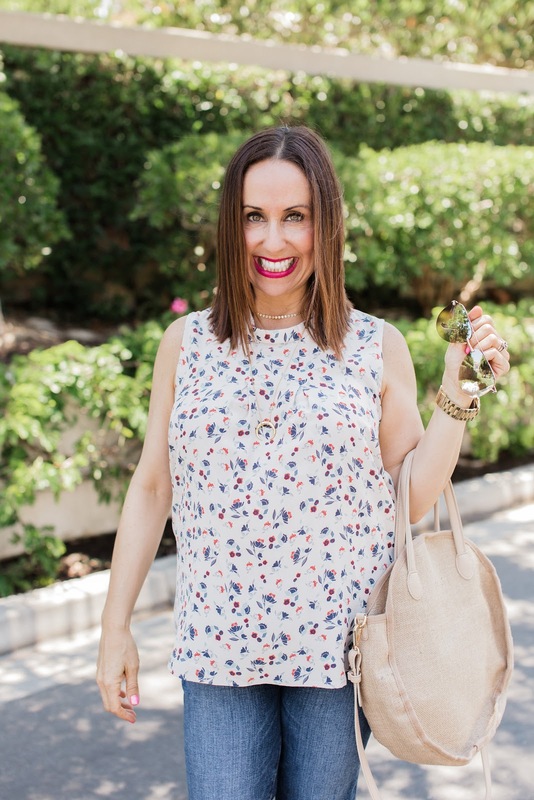 How fun is this summer dress that I styled as a fall duster? You can read about it more here. I hope you enjoyed all of my August looks. You can shop the looks by clicking on the links above. Thanks to Gabi Wells for photos. What are your favorite styles? Happy Reading!!!!! I can't believe that it is almost fall. I feel like this summer flew by, don't you think? 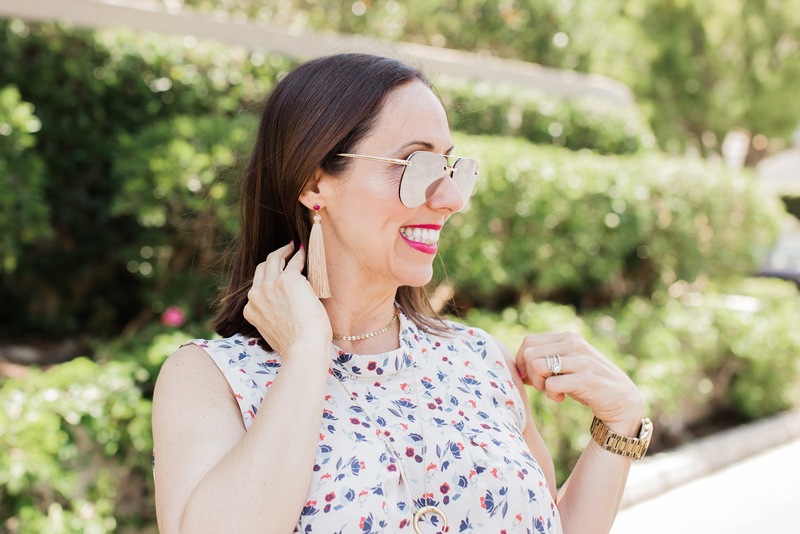 The transition between summer and fall can be tricky, but I'm ready for some fun fall looks. One way to transition from summer into fall is find a great summer piece and change it up by adding some fall elements. 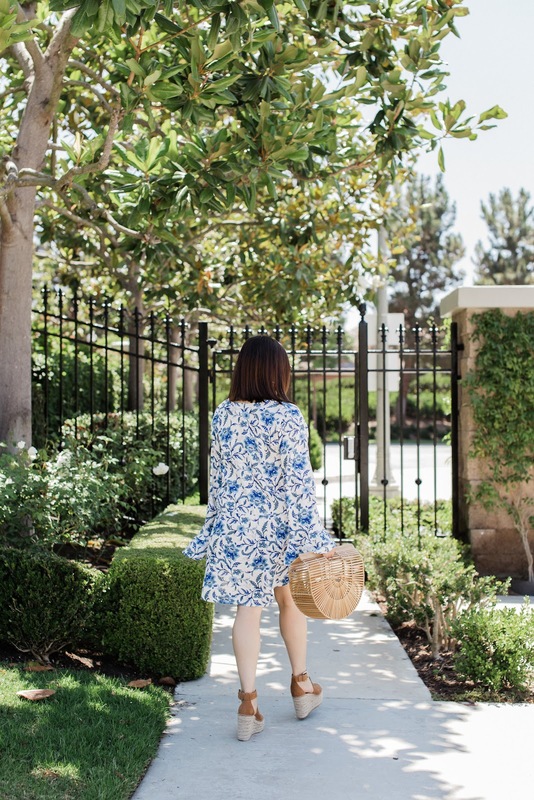 This floral dress I'm wearing above from H&M (so cute right) is a perfect dress to wear on a hot summer day. But I decided to turn it into a duster by wearing it open, adding a great white tee underneath, and layering it over some skinny jeans. I completed the look with some great furry mules and these perfect sunnies. It's as easy as that!!!! So look at the summer staples in your current wardrobe and see what all looks you can recreate. Let me know what you come up with. Thanks to Gabi Wells for photos. You can shop this looks through the links above and Happy Reading!!!!! My favorite bag of the summer is this one by Cult Gaia. I love the arc shape and it literally goes with everything. Have you guys seen it on the bloggers this summer? I wanted to share my favorite looks with this amazing bag!!! 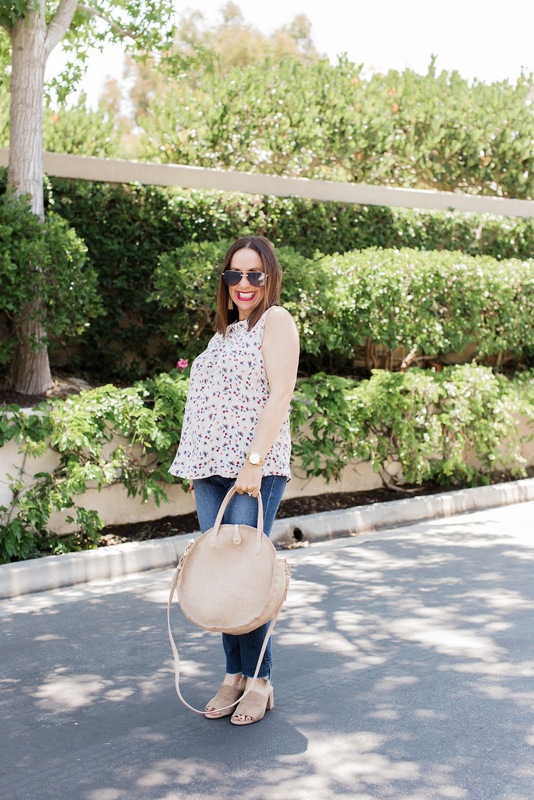 I love this adorable bag with cute top and some skinnies. You can see this post here. This is a sneak peak of an upcoming post. Stay tuned!!!! I love it with my favorite Free People dress of the summer. You can see more in this post. And how cute is it with this flow fun dress? You can read more here. What do you think of the summer "it" bag? Let me know. Thanks to Gabi Wells for photos and Happy Reading. Don't you just love when you find the perfect top? It seems like you can never have enough tops in your closet, right? I love having a variety of tops for date nights, brunching with the girls or just to wear running around town. 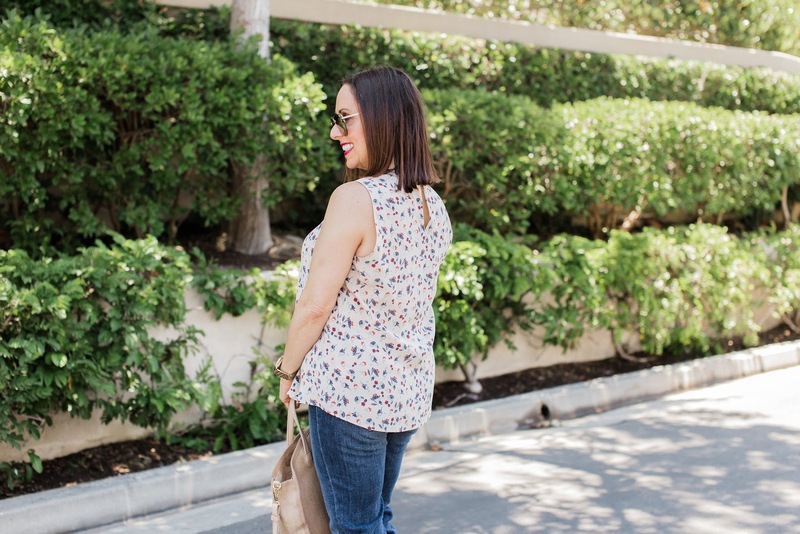 Every fashion girl needs the perfect top in her wardrobe that she can wear all day, or into the evening. I love this top by Amour Vert. 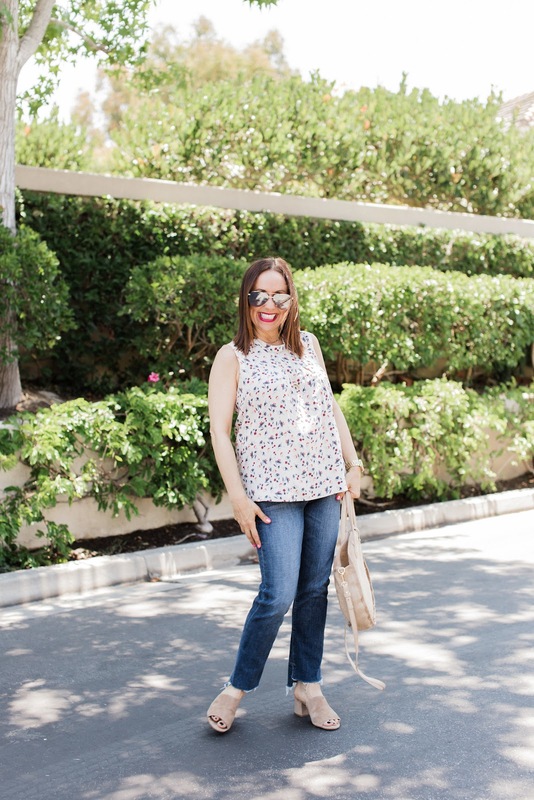 How cute is this floral print and it fits so well. I paired this adorable top with my favorite skinnies, these comfy mules and of course these fabulous Gorjana earrings (I'm obsessed). I recommend that you invest in a perfect top for your own wardrobe and remember there are so many options. What is your favorite style of tops? 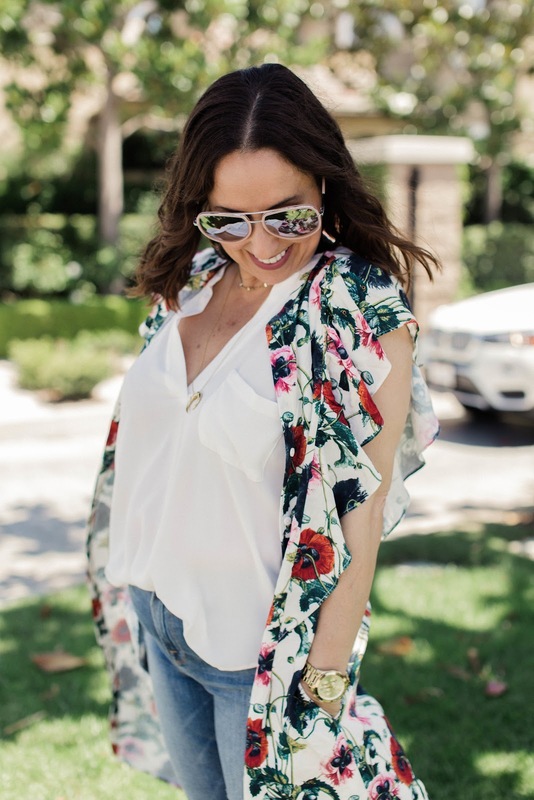 Do you like florals, or solids, sleeves or sleeveless, and the list goes on and on. Let me know in the comments. You can shop this look from the links above. Thanks to Gabi Wells for photos and Happy Reading!!! I love a great comfy jumpsuit. And this one by Minkpink is my favorite. I love the polka dots and how cute is the cropped length? The cropped jumpsuit is so on trend this season. And at only 5' 2" I can get lost in an average jumpsuit. This cropped version is perfect for people who are not the tallest (like me). 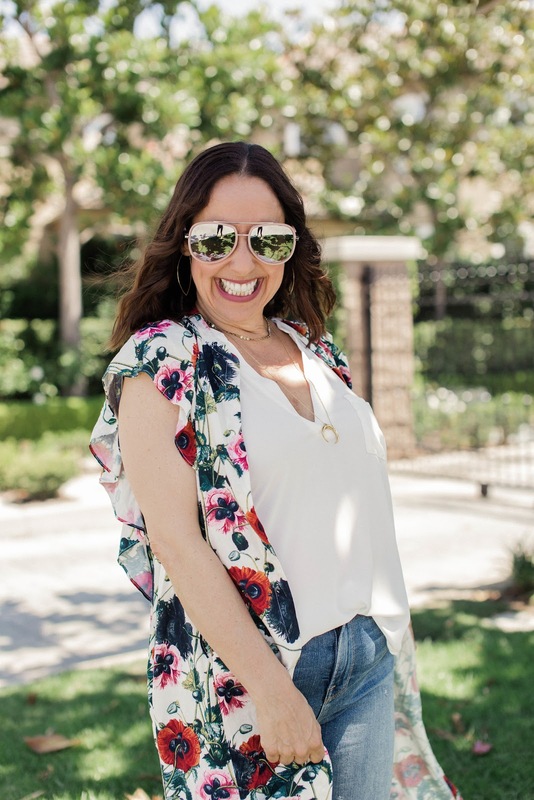 What I also love about this look is how easy it is to pack on a vacay. We are thinking of sneaking in one small family getaway and this folds up so easily and will not wrinkle. It will be the perfect piece. All I need to complete this look is some cute jewelry, and these fab wedges. 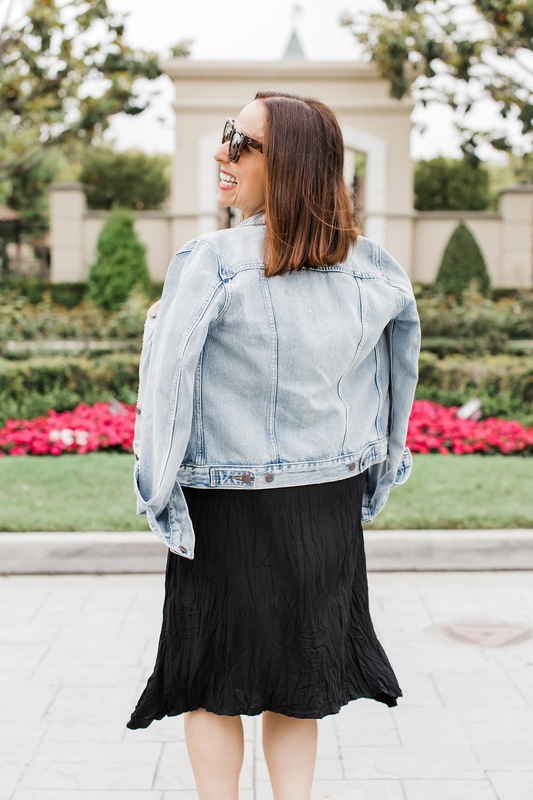 And for chilly nights a denim jacket is the perfect addition. So I hope you check out some cute jumpsuits. I have linked some styles that you can shop above. Thanks to Gabs Wells for photos, and Happy Reading!!!! Don't you just love fun patterns especially in summertime? There is something about a great print that always puts me in a good mood. I found this cute printed dress at Holly Sharp Boutique. 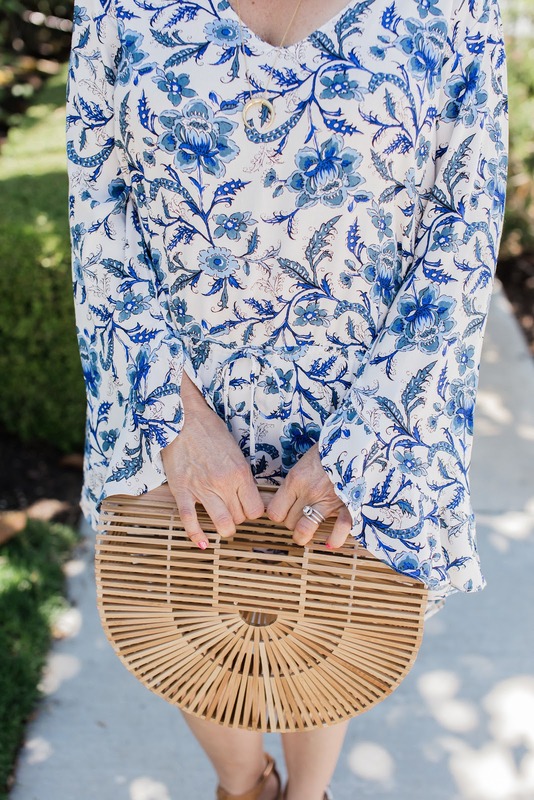 I love the different shades of blue and it is so flowy and airy, perfect for summer!!! Similar dresses here, and here. And I know I know, every blogger has this bag but I am absolutely obsessed. It's just so unique and I can't stop wearing it!!! I also love adding a great pink lip to this perfect summer look. Pink lips also make me so happy. I highly recommend you try out Holliegirl cosmetics. Such great lip shades. I also have been really into Bobbi Brown Liquid Lip Art Stick in Berry and in Pink Punch. They are also my go to summer pink shades. 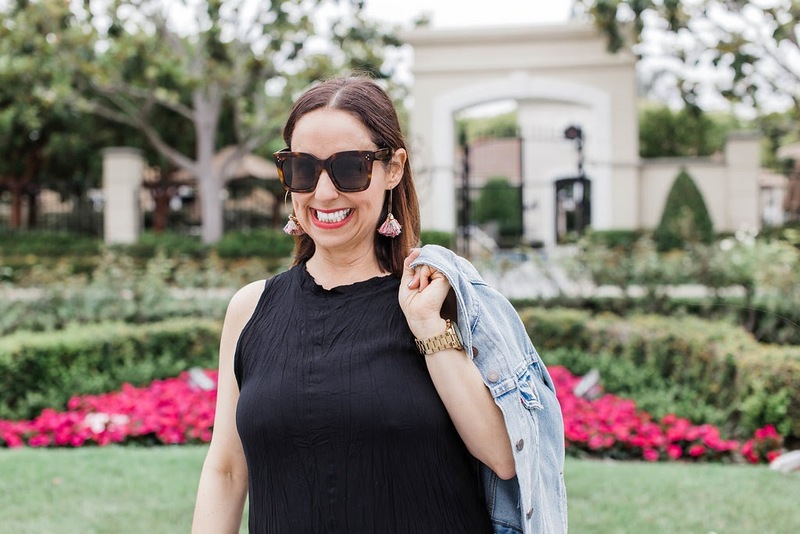 And this outfit wouldn't be complete without my go to summer shoe by Marc Fisher , my Quay sunnies and this Gorjana necklace. All I can say is love love love. SO keep on enjoying summer fashions friends. 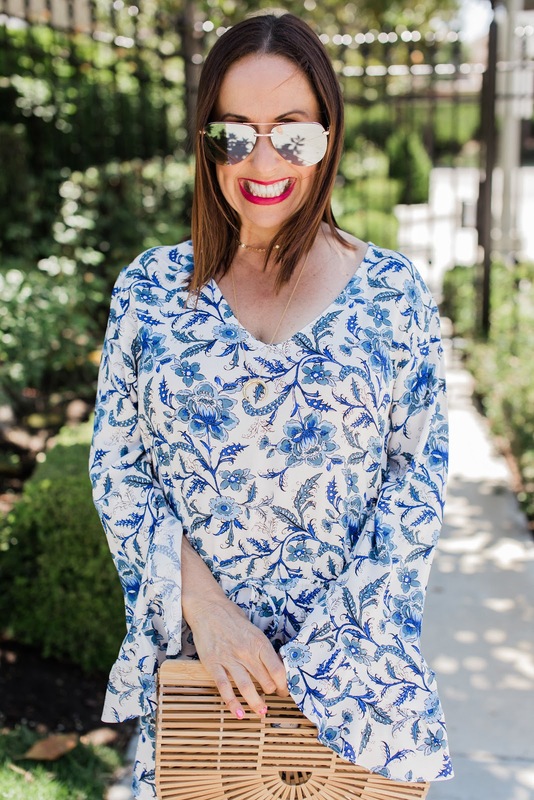 I know there has been a lot of talk about the upcoming fall but let's keep having fun with these flowy printed dresses and great bold lip colors. Thanks to Gabi Wells for photos and Happy Reading!! You can shop this look by clicking on the links above or the pictures below.